Spain has its fair share of quirky festivals, from the city-wide talcum powder fight that is Los Indianos on the island of La Palma to the fiery Las Fallas festival in Valencia. 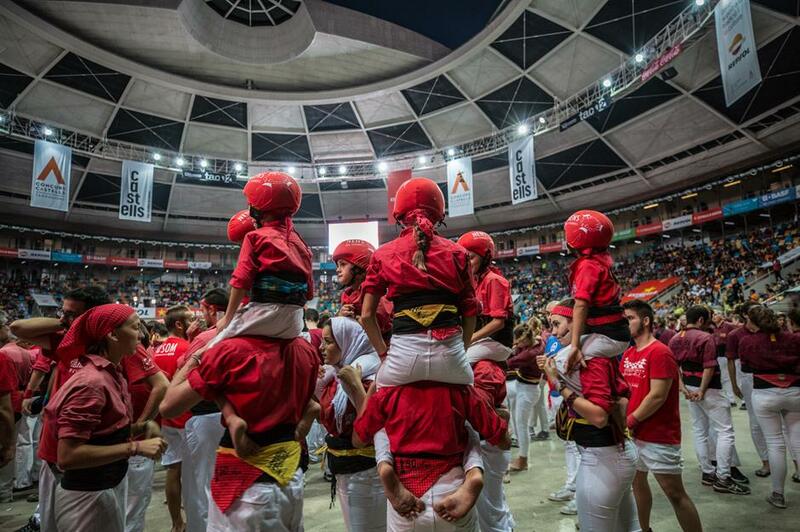 But nothing quite compares, in Spain or around the world, to Tarragona’s biennial Concurs de Castells – the Human Towers Contest. loveEXPLORING writer Lottie Gross and photographer Nori Jemil had front row seats at this year’s tournament. 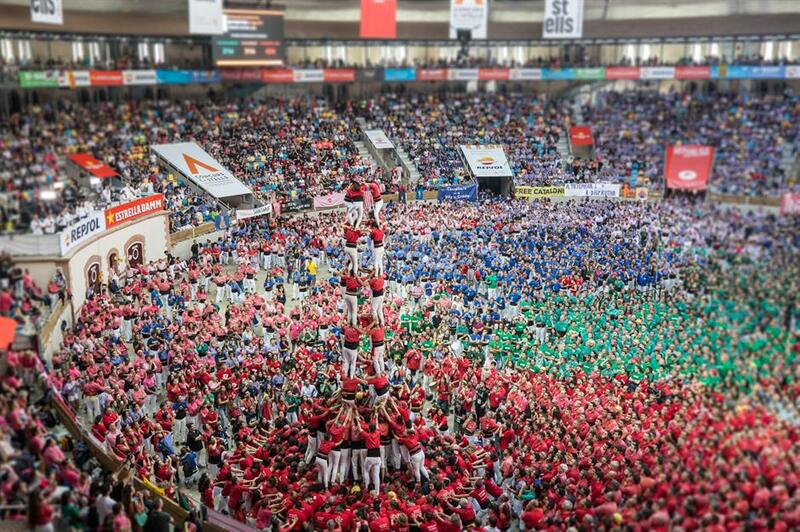 The only way to describe the tradition of castells, or human towers, is epic. There’s nothing quite like watching the physical and mental boundaries of human strength be pushed to, and sometimes beyond, their limits. But this impressive spectacle wasn’t always as ambitious, and actually had some fairly humble beginnings. 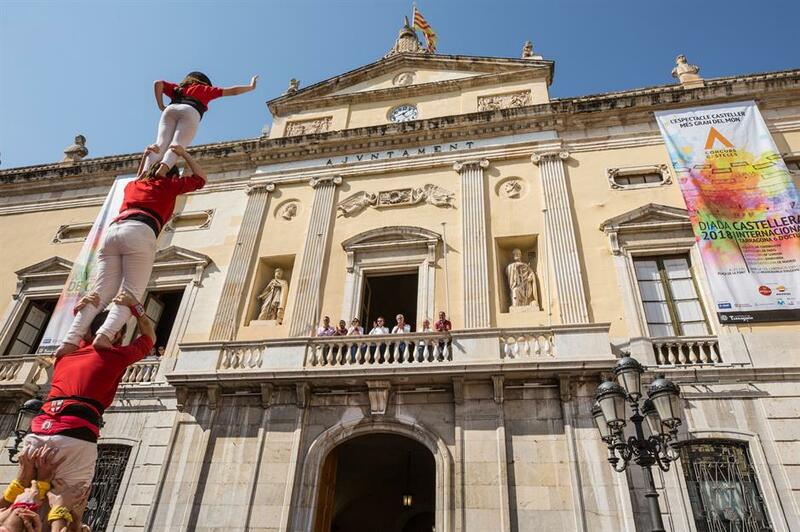 Originally part of a Valencian dance performed during religious celebrations, which would end with a group of men building a tower, the construction of castells caught on across the nearby Tarragona province. The original two colles (groups) were formed in the town of Valls – one with conservative-leaning beliefs and the other more liberal – and first documented in the early 1800s building towers of up to seven humans high. The growth of the tradition was almost stunted after years of Civil War in the 1930s and the fascist rule of Francisco Franco until 1975. But today it’s alive and well, and growing fast. 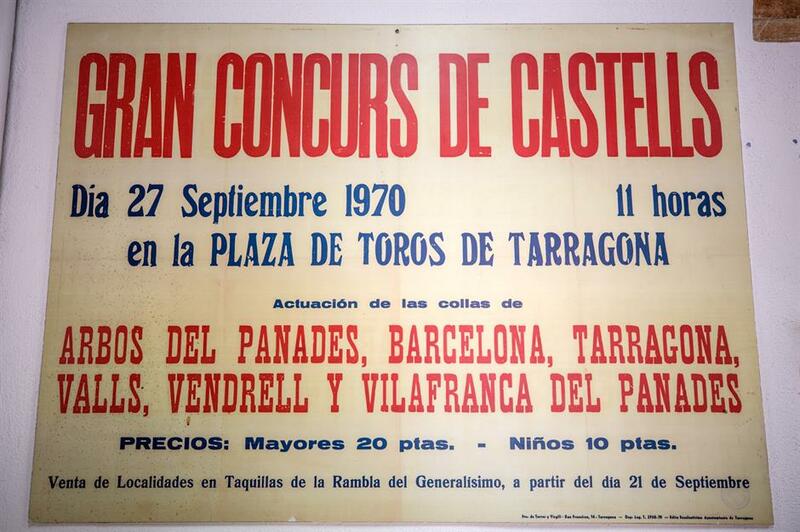 In 1977 there were just 14 groups in Catalunya constructing these stunning feats of human engineering, but today, historian Pablo Giori estimates that 90% of towns in Catalunya have a local team to support. 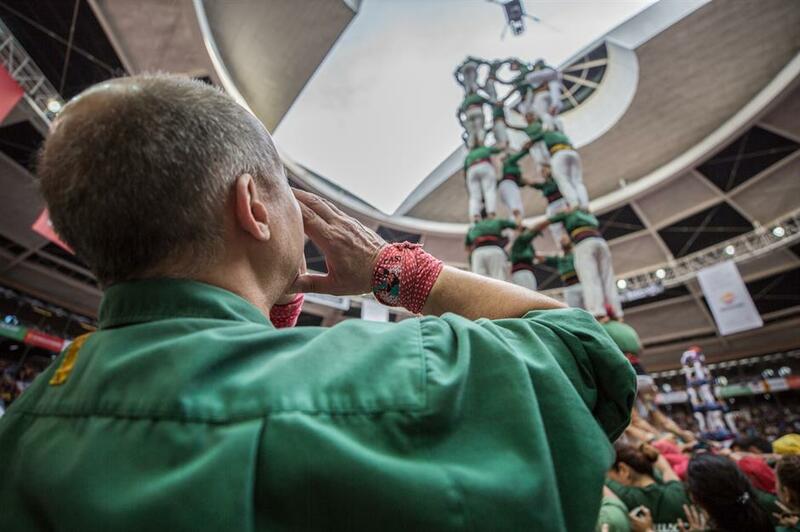 In 2010, the human towers practice was inscribed on the UNESCO list of Intangible Cultural Heritage. 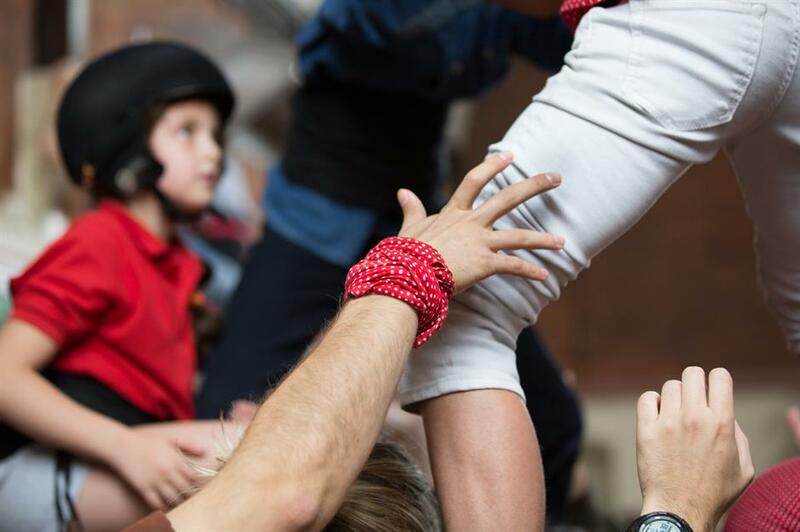 Nowadays, the castellers (the people who take part) are even more bold, reaching up to 10 levels and practicing throughout the year to compete in numerous competitions across Catalunya. They have as high a status as footballers in some towns in the region, there’s a league table and there are entire media organisations dedicated to reporting on the progress of teams throughout the country. 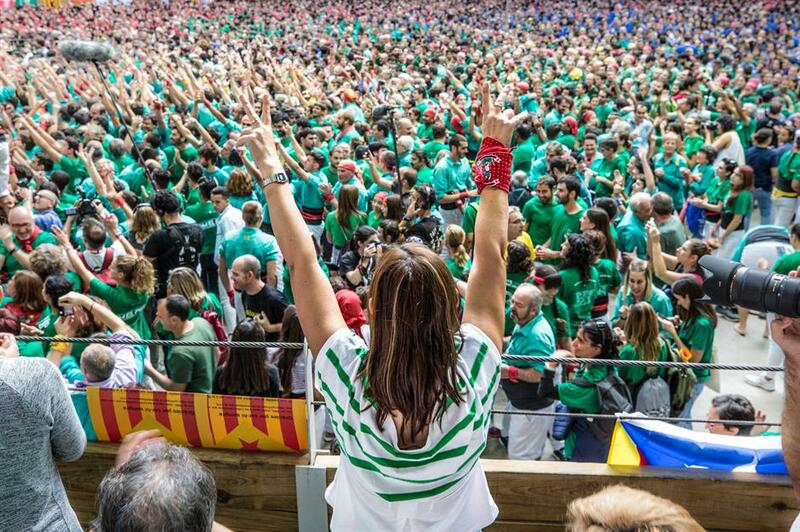 It has become an international pastime, too, and today there are 110 colles worldwide, from Copenhagen to Paris to Sydney, and over 90,000 participants in total. Even London has its own team, made up of brave individuals of all ages from Spain, the UK and Lithuania and reaching levels of up to six people high. 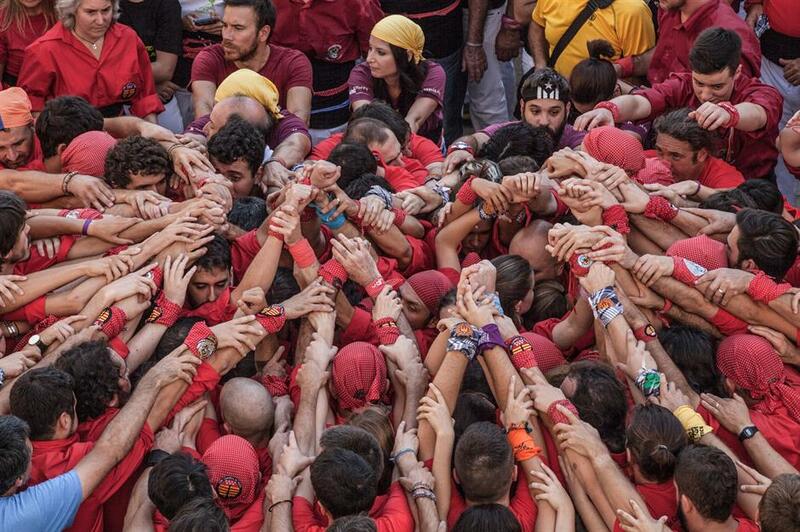 The biggest and most exciting gathering of human towers groups is the Concurs de Castells in Tarragona. 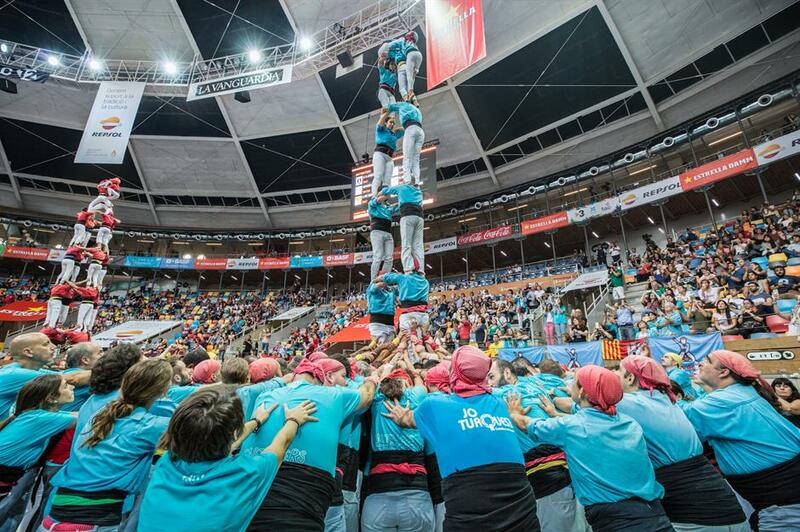 Every two years in October this beautiful Catalan city, with its Roman ruins and sweeping sandy beaches, is overtaken by thousands of participants and supporters of the sport who descend on the circular Tarraco Arena (pictured) for the Human Towers Contest. 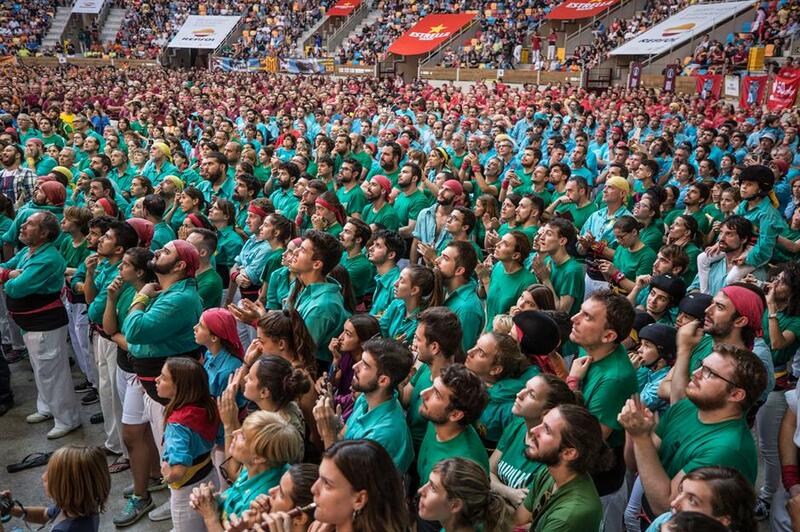 This year, more than 30 teams took to the arena, each wearing their own colours accompanied by the traditional white trousers. 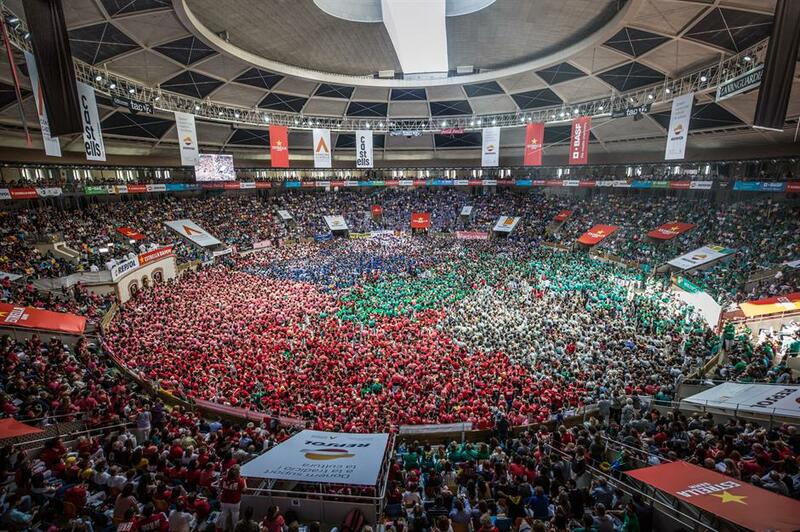 The sight of thousands of participants standing on the main floor together is incredible in itself, let alone when they begin building complex structures. Each casteller wears a uniform: their team’s coloured shirt; white trousers; a mocador, or handkerchief, often worn around the wrist or neck; and a tightly-wrapped sash, called a faixa. The faixa is the most important piece of kit – it acts as support for the waist and spine for those nearest the bottom of the tower, as well as a tool for the climbers to use as they hook their feet into it, raising themselves onto the shoulders of their teammates. 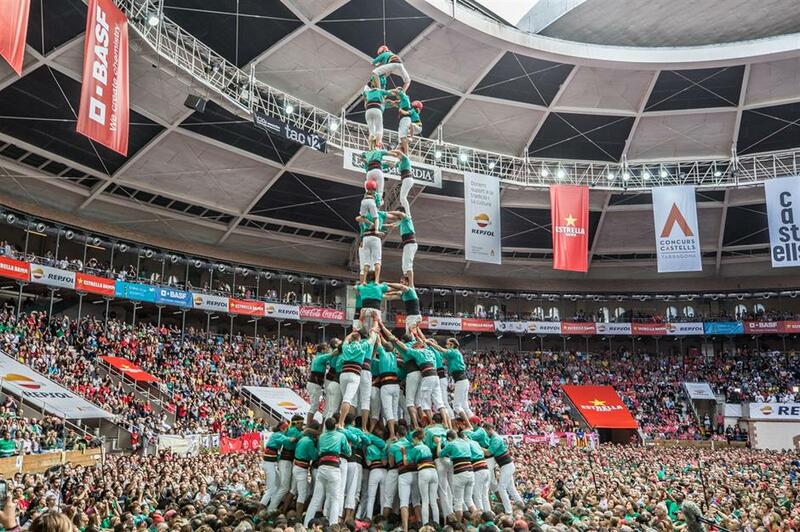 Every tower begins with a pinya – the base – where, like sardines in a tin, hundreds of people crush themselves together to create a sturdy foundation. Facing inwards, they stretch their arms out ahead to support the central tower as it rises. On taller towers, more than one base is often required – a second-storey base is a folre and a third is a manille. It's rare to see towers or eight storeys or more without additional bases, but when a colla is playing to win they might risk a tower of nine or 10 without both the folre and manille. It's said this is the only sport in which the older you get, the lower down the chain you go. The biggest, strongest members of the team generally make up the base and the lower levels of the tower – they have to be able to bear the weight of at least two other people on top of them, after all. 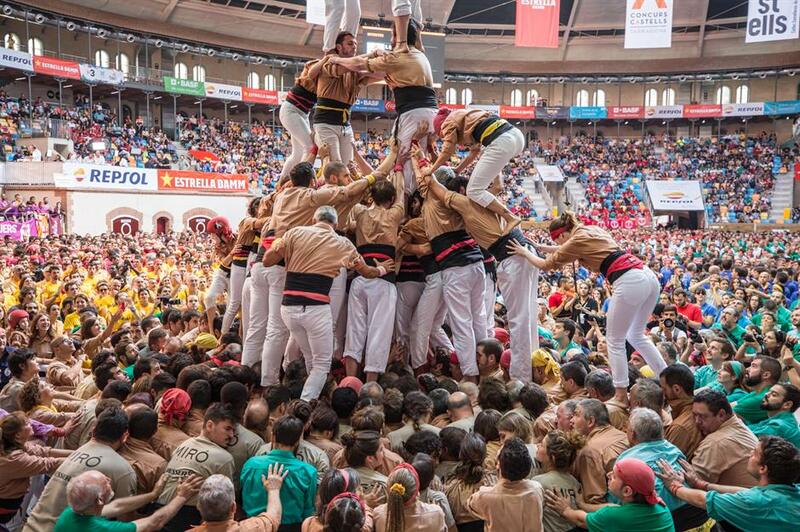 They’re hoisted up onto the pinya and tread carefully on their fellow castellers shoulders to take their place in the centre. 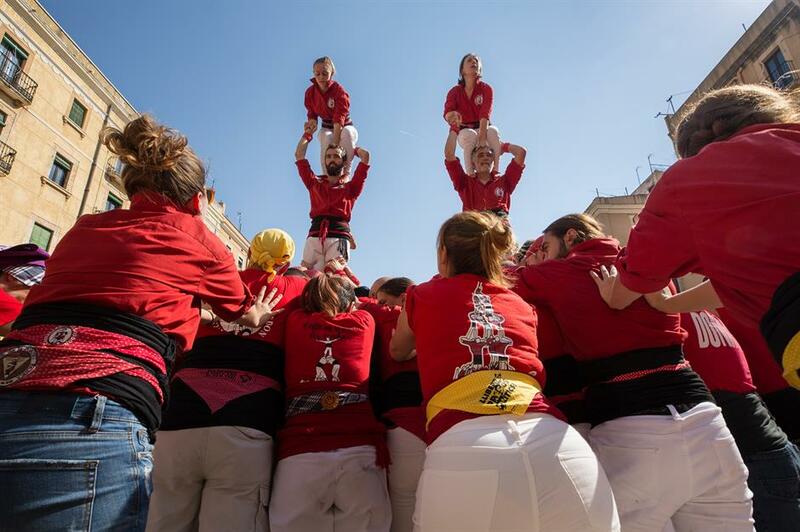 The younger, more slender team members will then climb up their fellow castellers, using the faixa and their own strength to ascend as quickly and carefully as possible – climb too fast and they risk the integrity of the tower, climb too slow and the castellers in place could collapse under the weight of their teammates. 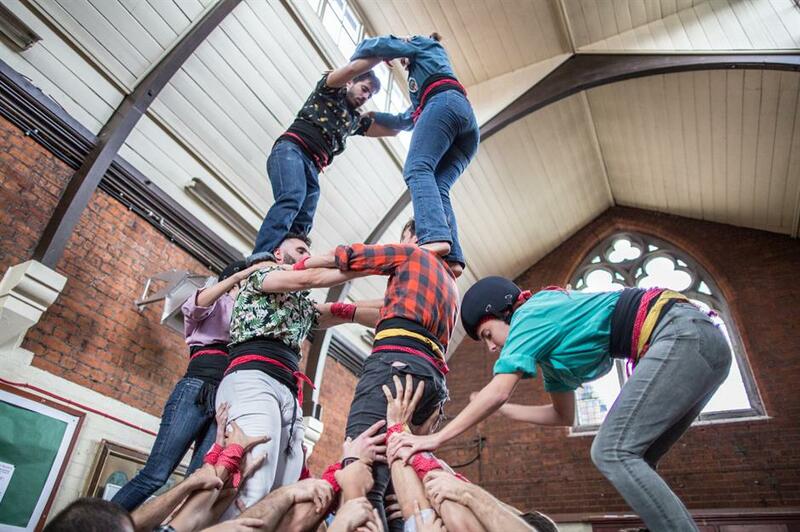 The central trunk can be made up of as many as four castellers with their arms locked together to create a solid structure. The fewer sides to the trunk and the taller the tower, the more difficult stability is to maintain and the more points the team will receive if they build and dismantle it safely. At the top of every castell is a pair of children. Often as young as five years old, one creates a bridge between two sides of the tower, and the other climbs on top, raising a hand in the air to signify completion. These brave kids play the most important role in the tower because as they climb, they determine whether a structure is safe to complete. 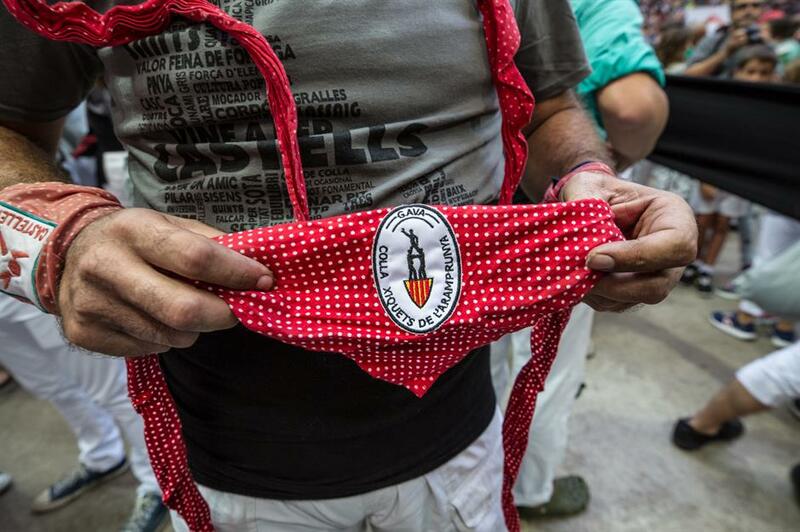 If not, they’ll return to the ground and the entire castell will have to dismantle. There’s a collective tension in the arena as each tower is built and the crowd waits silently, then erupts with cheers as the enxaneta reaches the top. Once the entire tower has been safely dismantled, there’s a raw, unabated delight among spectators and participants alike. It’s not always such a celebration, though. Many towns have more than one colla, so there’s serious rivalry between them. 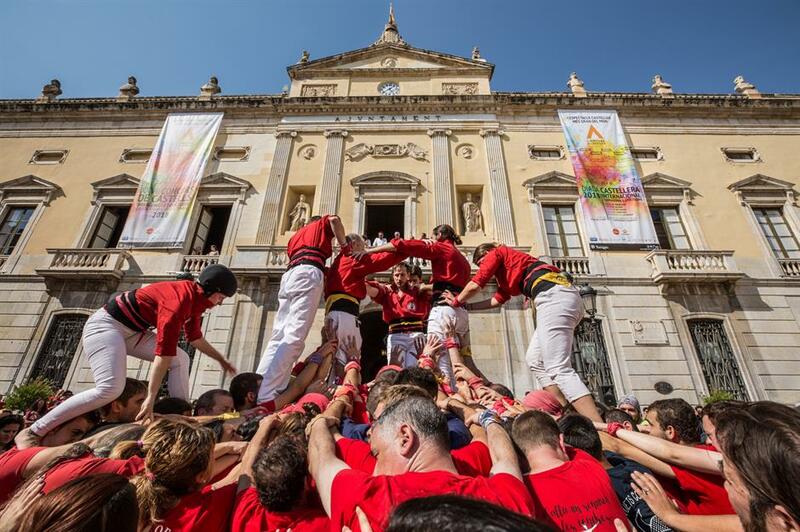 This year, Colla Joves Xiquets de Valls were left stony-faced as their opponents, Colla Vella, won with towers up to 10-humans-high. Of course, not all towers are made equal, and many do collapse. This dangerous sport results in a lot of broken bones, and participants have even died as a result. Since 2006, when 12-year-old Mariona Galindo passed away two weeks after falling from a nine-storey tower, the Coordinadora de Colles Castelleres de Catalunya issued all enxanetas with specially-designed helmets for protection. When a tower falls, there’s one rule: don’t move anybody. 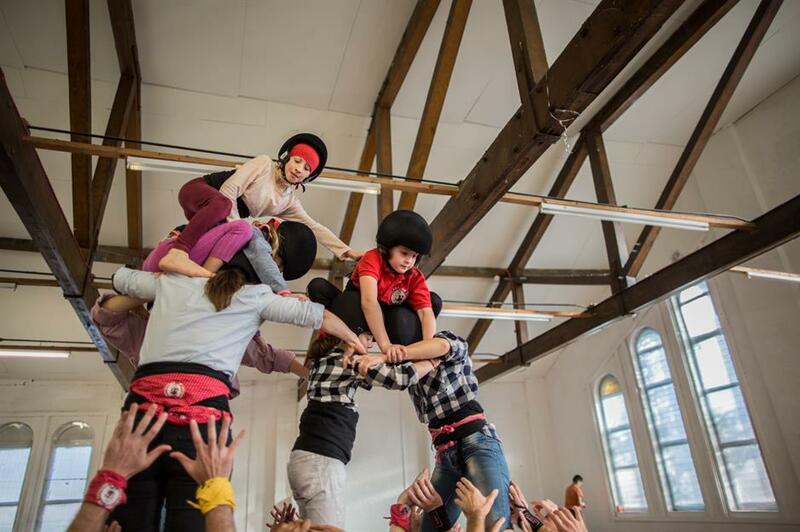 Castellers must pick themselves up and safely dismount the pile of bodies so paramedics can ascertain who needs urgent, specialist help. 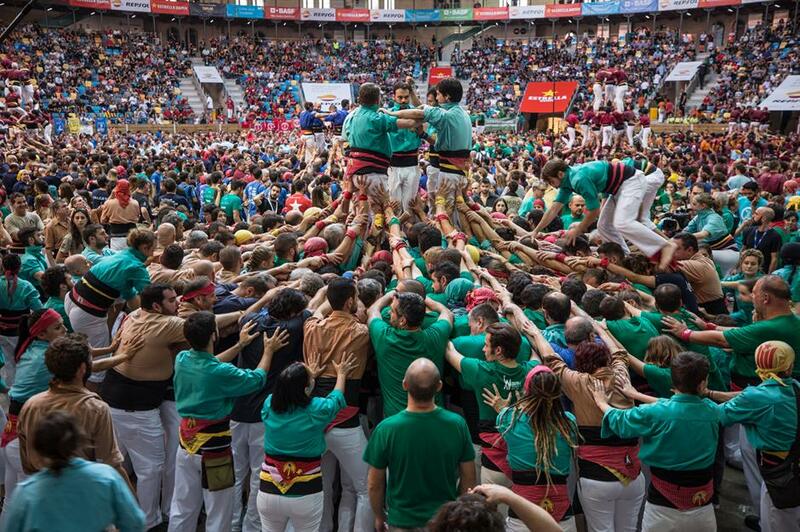 This year, many of the participants were carried out of the arena on stretchers, only to return and climb again once recovered. 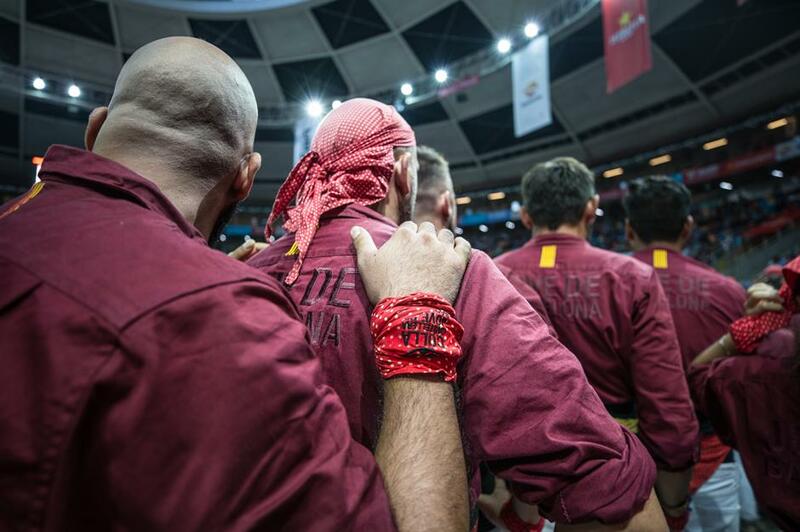 It’s partly that bravery, and the evident care for one another the castellers display, that makes this such a beautiful and mesmerising sport. The colles are more like huge families than sports teams, and their camaraderie extends well beyond building human towers. They work together to raise money for their groups, they attend each other's weddings, they band together if one needs financial help, and, of course, they share beers after practice. 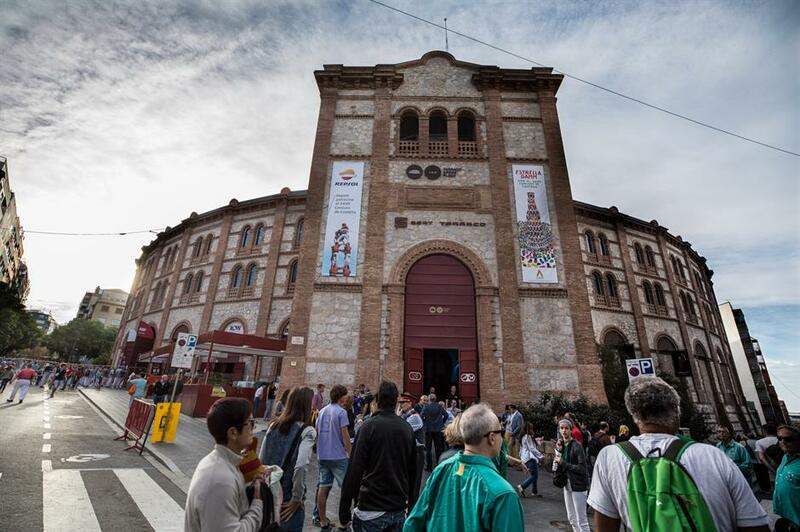 For brilliant tips about what else to see and do in Spain, check out our pick of the best bits.